The SWAMP program has a specific goal embedded in its acronym “assessing and monitoring”. As part of its work we now have parallel work that deserves its own voice, that of developing a new protocol for sampling standing water for benthic invertebrates. Thank you to the Columbia Basin Trust for support in 2016. Below is the executive summary from an application we made to the Environment Canada’s National Wetland Conservation Fund with their letter of support for 2016/17. Macroinvertebrates are organisms without a backbone that are visible to the naked eye. Macroinvertebrates encompass a large variety of wetland taxa including the well known group of dragonflies and damselflies. The aquatic life stages of macroinvertebrates are important indicators of anthrop ogenic-induced stresses such as habitat degradation, development and contaminants (Mazzacano 2011, Uzarski et al. 2011, Archer et al. 2010, and Apfelbeck 2000). Private landowners: Want to learn more about your backyard wetland? Few studies of wetlands in British Columbia have included bioassessments of macroinvertebrates with the exception of Adama et al. (2013) and Miller and Hawkes (2013). However, these methods provide a unique approach to assessing bio-integrity and fit well with methods currently being used by the Slocan Wetlands Assessment and Mapping Program (SWAMP). The objective of this study is to develop potential methodologies for the Slocan Wetland Assessment and Mapping Program (SWAMP) based upon methods used by Environment Canada under the Canadian Aquatic Biomonitoring Network, CABIN, (Tall et al. 2008, Bailey and Reynoldson 2009) and other programs in Canada (Adama et al. 2013, Miller and Hawkes 2013, Archer et al. 2010, Eaton 2005) and the United States (Kovalenko et al. 2014, Uzarski et al. 2011, Mazzancano 2011, Apfelbeck 2000). These methodologies have the potential to provide further inference about the status of wetlands in the Slocan Valley (Quamme 2016. Quamme et al. 2016). This tool will provide insight into restoration and enhancement opportunities as well as the capability for long term monitoring of these projects to assess the success of the restoration or enhancement. Develop a protocol for wetlands assessment based on Environment Canada CABIN methods to help assess impacts, prioritize wetland restoration opportunities and evaluation of restoration recover. The program is led by Darcie Quamme of Integrated Ecological Research and carried out by Rhia MacKenzie, Richard Johnson, Ryan Durand, Tyson Ehlers and Passmore Laboratories. New for 2016/17 is a collaboration with the Ministry of Forest, Lands and Natural Resources, the Columbia Basin Watershed Network and the Slocan Streamkeeper Society to use these tools evaluate restoration work. If you are a private land owner and want to learn more about your wetland our study is looking for sites on private land. More info. The mapping and vegetation assessment work funded by the Columbia Basin Trust and led by Ryan Durand of Durand Ecological Consulting is an essential component of this project that will lead to some very interesting results. 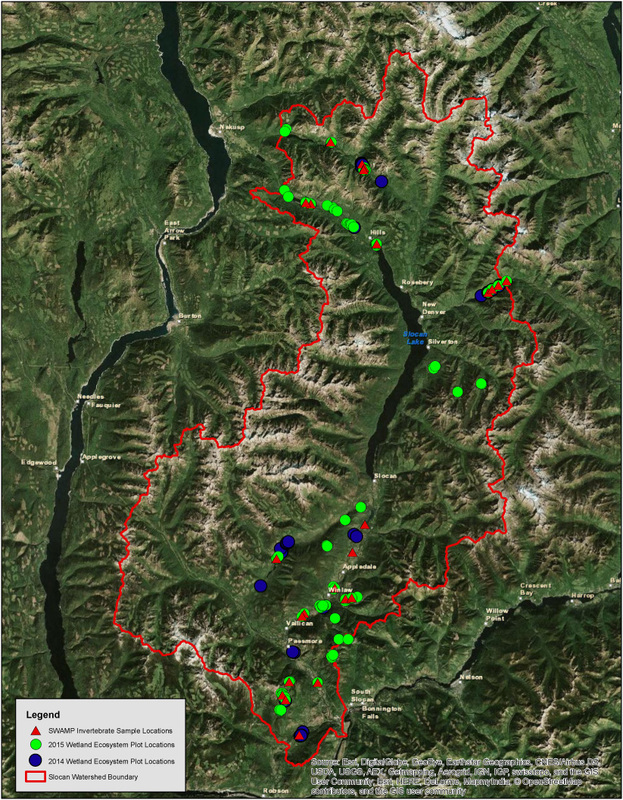 See our recent map of 34 invertebrate sampling sites and over 50 ecosystem sites located throughout the Slocan Valley. In addition, the Royal BC Museum has agreed to house a reference collection of invertebrates from the Slocan Valley in perpetuity because of the importance of Slocan Valley wetlands provincially. The Royal British Columbia Museum holdings will be available for further research and public inquiry, thus ensuring verification, taxonomic consistency, and repeatability. Dr. Rebecca Rooney of the University of Waterloo provided a review on the development of the quantitative “Wetland Stress Gradient” portion of our work. Thank you Rebecca! See the May 2016 report on the provincial database at EcoCat. A big thank you goes out to our supporters including the National Wetland Conservation Fund, the Columbia Basin Fish and Wildlife Compensation fund, the Columbia Basin Trust and the Ministry of Forest, Lands and Natural Resources and the BC Wildlife Federation. Adama, D., V.C. Hawkes, M.T. Miller, and J. Sharkey. 2013. CLBMON-61 Kinbasket Reservoir Wetlands Monitoring Program. Annual Report – 2012. LGL Project EA3398. Unpublished report by LGL Limited environmental research associates, Sidney, BC for BC Hydro Generations, Water License Requirements, Burnaby, BC. Apfelbeck, R. 2000. Development of biocriteria for wetlands in Montana. Prep. for Montana Department of Environmental Quality, Helena, Montana. Archer, R.W., Christopher, P., Lorenz, J. and Jones, K.E. Monitoring and assessing marsh habitat health in the Niagara River area of concern. Prep. for Environment Canada-Great Lakes Sustainability Fund. Bailey, J.L. and Reynoldson, T.B. 2009. Preliminary wetland aquatic biomonitoring data collection manual. Commissioned for: Canadian Wildlife Service (Yukon). Bayley, SE, Wilson, MJ, Rooney RC, and Bolding MT, 2014. Assessment Methods for Reclamation of Permanent Marshes in the Oil Sands: Handbook and Video. Prepared by The Bayley Lab, Department of Biological Sciences, University of Alberta, Edmonton, Alberta. Durand, R. 2014. SWAMP Phase I: Slocan Wetlands Assessment and Monitoring Project. Prep. for: Slocan Solutions Society, Slocan Lake Stewardship Society, BC Wildlife Federation and Slocan River Streamkeepers. Eaton, B. 2005. Report on tests of aquatic sampling protocols, Alberta Biodiversity Monitoring Program. Prep. for Alberta Research Council. Environment Canada. April 2007. CABIN Field Manual for Streams. Reynoldson, T. B., C. Logan, T. Pascoe, S. Thompson, S. Sylvestre, C. Mackinlay, and H. McDermott. Environment Canada. April 2012. CABIN Laboratory Methods: Processing, taxonomy and quality control of benthic macroinvertebrates. H. McDermott, T. Paul and S. Strachen. Faber-Langendoen, D., C. Hedge, M. Kost, S. Thomas, L. Smart, R. Smyth, J. Drake, and S. Menard. 2012a. Assessment of wetland ecosystem condition across landscape regions: A multi-metric approach. Part A. Ecological Integrity Assessment overview and field study in Michigan and Indiana. EPA/600/R-12/021a. U.S. Environmental Protection Agency Office of Research and Development, Washington, DC. Faber-Langendoen, D., J. Rocchio, S. Thomas, M. Kost, C. Hedge, B. Nichols, K. Walz, G. Kittel, S. Menard, J. Drake, and E. Muldavin. 2012b. Assessment of wetland ecosystem condition across landscape regions: A multi-metric approach. Part B. Ecological Integrity Assessment protocols for rapid field methods (L2). EPA/600/R-12/021b. U.S. Environmental Protection Agency Office of Research and Development, Washington, DC. Mazzacano, Celeste. 2011. 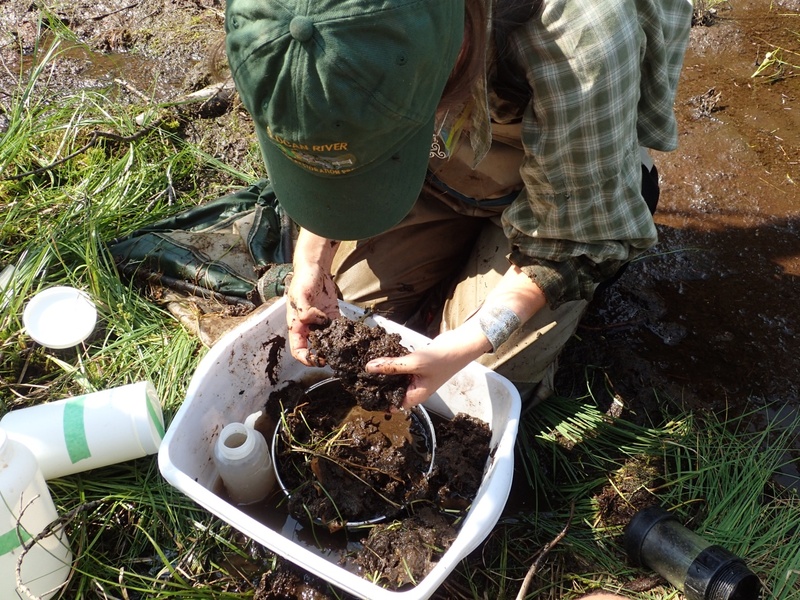 Developing a framework for the Oregon Wetland Monitoring and Assessment Program: Developing an invertebrate-based monitoring tool to assess the biological integrity of Pacific Northwest Freshwater Wetlands. Prep. for Oregon Watershed Enhancement Board. by Xerces Society. Miller, M.T. and V.C. Hawkes. 2013. CLBMON-11B4 Monitoring Wetland and Riparian Habitat in Revelstoke Reach in Response to Wildlife Physical Works. Annual Report – 2012. LGL Report EA3413. Unpublished report by Okanagan Nation Alliance and LGL Limited environmental research associates, Sidney, BC, for BC Hydro Generation, Water Licence Requirements, Burnaby, BC. Quamme, D.L. 2016. Development of a Multimetric Index Biotic Integrity for wetland invertebrates. [PowerPoint slides]. pdf. Quamme, D.L. 2015. Protocol for 2016 field sampling of wetland macroinvertebrates. Prep. for Slocan Valley Wetland Assessment and Mapping Project, Slocan River Streamkeepers, Passmore, B.C., Slocan Solutions Society and Slocan Lake Stewardship Society, New Denver, B.C. pdf. Rooney and S. E. Bayley. 2010. Quantifying a stress gradient: An objective approach to variable selection, standardization and weighting in ecosystem assessment. Ecological Indicators 10: 1174-1183. Tall, L., G. Méthot, A. Armellin and B. Pinel-Alloul. 2008. Bioassessment of Benthic Macroinvertebrates in Wetland Habitats of Lake Saint-Pierre (St. Lawrence River) (St. Lawrence River). J. Great Lakes Res. 34: 599-614. U.S. EPA. 2002. Methods for Evaluating Wetland Condition: Developing Metrics and Indexes of Biological Integrity. Office of Water, U.S. Environmental Protection Agency, Washington, DC. EPA-822-R-02-016. Uzarski, D.G., Brady, V.J., Cooper, M. 2011. Quality Assurance Project Plan, GLIC: Implementing Great Lakes Coastal Wetland Monitoring. Prep. for U.S. EPA GLNPO (G‐17J) 77 W. Jackson Blvd. Chicago, IL, 60604‐3590, Contract/WA/Grant No./Project Identifier: EPAGLNPO‐2010‐H‐3‐984‐758.